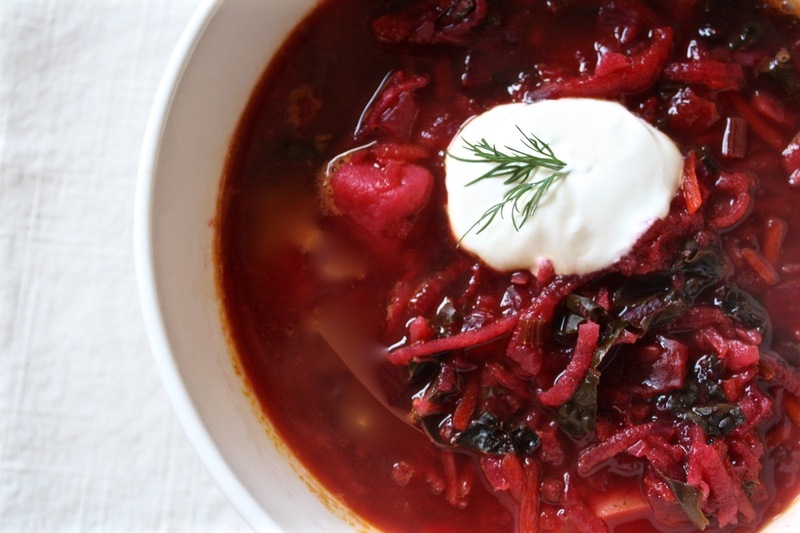 This is not my first borscht post, and it probably won't be my last... but I wanted to share another recipe, because 1) borscht is so good to make this time of year 2) I recently wrote about it for NuRoots and Beyond Bubbie. Happy beet soup making! My parents immigrated from the former Soviet Union in the late seventies. While my family quickly adjusted to life in America, and adopted many of the local culinary practices, there were certain dishes that were fixtures growing up: beet salad, stuffed cabbage, piroshki, marinated and pickled vegetables, and borscht. My grandmother’s borscht has been and will always be one of my favorite things to eat. For two years in my mid twenties, I was lucky enough to live and work on the island of Oahu. There are many things to love about Hawaii: the smell of plumeria that permeated everything, the fresh mangoes that grew everywhere, and always being a few minutes away from the ocean. But the thing I love most about Hawaii are the people. What does Hawaii have to do with borscht? One weekend while I lived there a local friend and I decided to spend a day cooking our family’s favorite traditional recipes. He built an Imu (Hawaiian underground oven), and made watercress beef soup, a chicken, and a sticky rice dessert. Using the more conventional above-ground stove, I made borscht. These were the dishes our families made for us, and we were eager to share and try our recipes with the other. My grandmother made borscht on a regular basis. Soup is eaten every night in her home before supper’s main course. I love how she always adds tomato to the soup, and how she painstakingly shreds and then sautées the beets and carrots separately before adding them to the rest of the broth. I love the pleasure she takes in making borscht. There’s absolutely nothing wrong with her recipe, but over the years I’ve changed some steps, and I’ve played around with the ingredients. Sometimes I switch out cabbage for other greens that I already have waiting in the fridge. That day in Hawaii was the first time I ever made borscht on my own. Before I did anything, I called my grandmother and had her walk me through each and every step. I took copious notes and followed her instructions fastidiously. It took all day for the dishes to cook in the Imu, and it took hours for me to make the borscht. When everything was finally ready we set the table outside on the fenced-in porch that was larger than my friend’s entire home. We ate while rain fell, looking out at the still smoking Imu in the yard and the mountains that loomed over the property. Hot bowls of two different kinds of soup kept us warm on that “chilly” Hawaiian evening in February. It remains one of the more memorable meals of my life; food and place equally incredible. And the borscht came out tasting as close to my grandmother’s version as I could aspire to make. While that first borscht-making foray may have been the most memorable, I continue to make borscht in far less spectacular settings. In fact, I love this soup for its simplicity. Making borscht is an excellent way to clean out the fridge and throw a bunch of unglamorous vegetables into a pot. You can make a lot of borscht in one go, and feed a big crowd with little investment of time or money. This soup is earthy, sweet, acidic, full of flavor. Adding a few key ingredients - fresh dill, lemon juice, garlic - make this soup taste extra good. Make sure to taste as you go along. Depending on your preference add more of this, less of that, a bigger pinch of salt, or an extra squeeze of lemon. All vegetables vary in flavor so this recipe is a guide not the law. There are endless variations to borscht, but so long as you have beets you’re on your way to making a meal that can feed a small tribe. Peel your beets and carrots. If you want to avoid staining your hands use disposable gloves while handling the beets. Using a food processor with the shredding disc attachment, or using the medium-size hole on a box grater, grate your beets and carrots. Prepare the rest of your ingredients for the soup: chop the onion, mince the garlic, dice the potato, chop the greens, chop the dill stems and fronds, and chop the parsley. To a large pot on medium heat add the olive oil. Add the shredded beets, carrots, onion and salt to the pot. Sweat the vegetables over medium heat for 8-10 minutes, or until the vegetables are softened. Add the garlic to the pot and cook for 2-3 more minutes, or until the garlic releases its aroma and is no longer raw. Add the tomato paste, and tomato to the pot, and stir until well combined. Tomato is an important ingredient in this soup - it lends a note of acidity and depth to the sweet beets. During tomato season I prefer to use fresh tomatoes, but use whatever you have. My grandmother has even been known to use jarred Marinara sauce (and she is the queen of borscht). To the pot add the diced potatoes, liquid, and bay leaf. Bring the liquid up to a simmer, then turn down the heat and simmer the borscht for 35-45 minutes allowing the flavors to come together. After 30 minutes, add the chopped greens, and chopped dill stems to the soup. Simmer for 15-20 more minutes, or until the greens and all of the vegetables are completely soft and tender. Turn off the heat, and add the chopped dill fronds, parsley, and lemon juice. Taste and season with salt and pepper. Add more lemon juice if desired. Serve with sour cream and a sprinkle of fresh chopped dill.